Our Tools of the Trade calendar 2013 has so far taken us to Suffolk, Norfolk, Sussex, The Cotswolds, Shropshire, Wales, the West Midlands and London ( twice ). 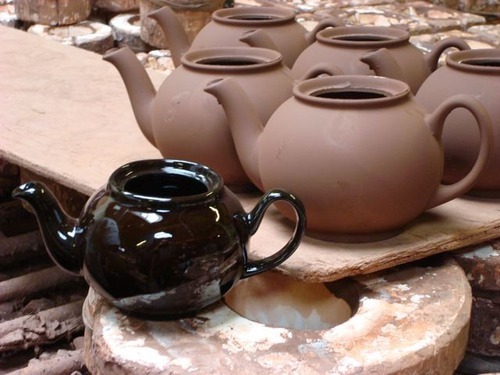 September sees us arrive in Tunstall, Staffordshire - home of Cauldon Ceramics, makers of our Brown Betty teapot. Tunstall is one of the six towns which form Stoke-on-Trent, colloquially known as ‘The Potteries’. 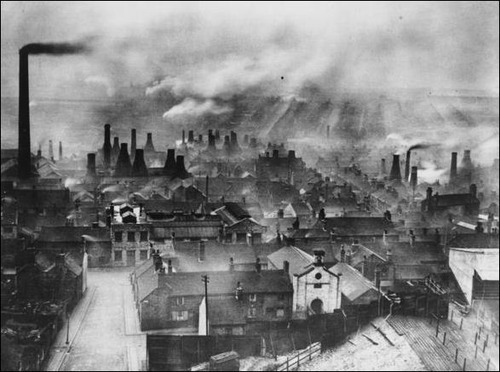 The local abundance of clays and the easy access to coal made Tunstall, along with Fenton, Hanley, Burslem, Longton and Stoke the perfect location for a rapidly expanding ceramic industry, with local names like Spode, Doulton, Wedgewood and Minton establishing their manufactories in the area. Throughout the nineteenth and twentieth centuries the growing industrialisation of the manufacturing process lead to the establishment of Stoke-on-Trent as one of Britain’s industrial heartlands, creating products to be sold throughout the country, the Empire and beyond. 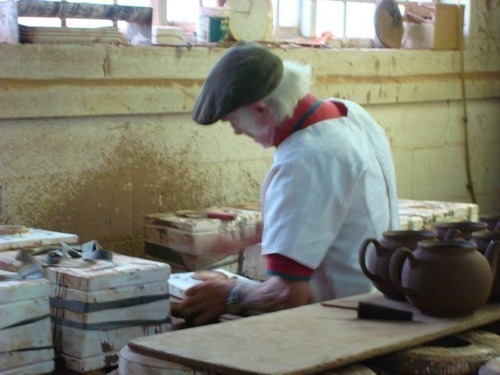 But while Wedgewood, Doulton and Spode were looking to refine their china clays and porcelains to cater to the booming middle class, the local red clay of Tunstall was perfect for manufacturing cheap and durable domestic ware, and, in particular, teapots; the clay retaining the heat and the large rounded shape allowing the tea room to brew to perfection. 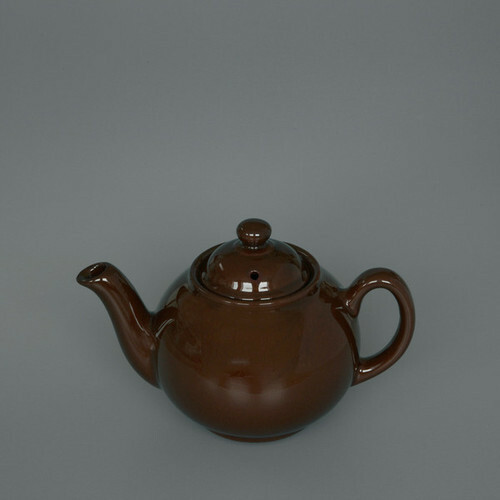 This simple, functional pot became known as the Brown Betty. 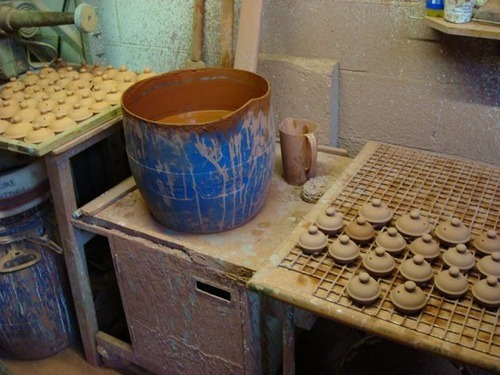 Cauldon’s Brown Bettys are made in the traditional slipcast manner where slip - a clay and water mix - is poured into plaster moulds. 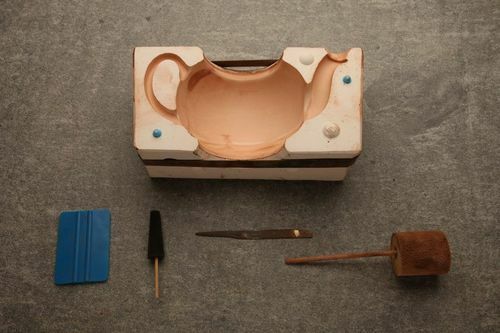 As the plaster absorbs the water from the slip the clay forms and hardens inside the mould. After the slip has been inside for a certain amount of time it is poured out, leaving a thin layer of clay - in this instance in the shape of a teapot. Moulds ready for filling with slip. 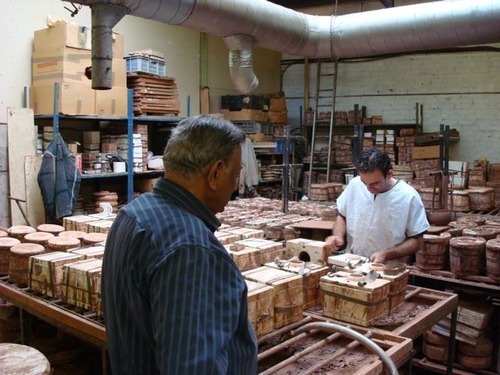 Factory owner Zamir overseeing the filling process. 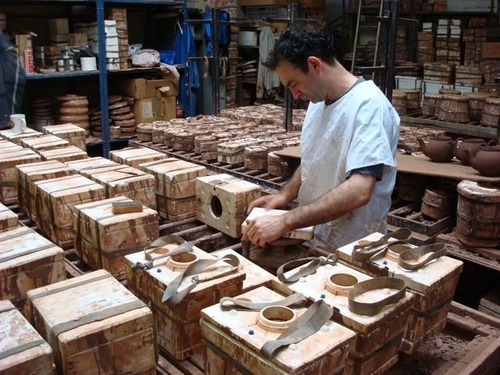 Filled moulds waiting to be emptied - the amount of time the slip is left in the mould before emptying determines the thickness of the finished pot. Too short and the pot will be brittle and breakable, too long and it will be heavy and ungainly. 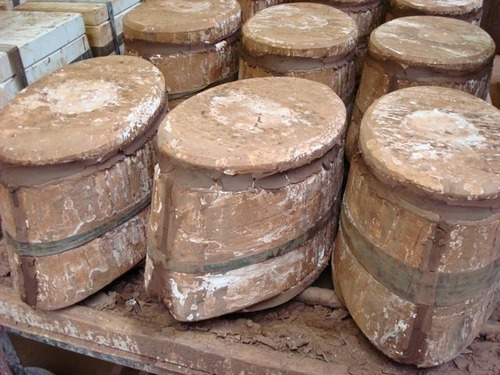 The moulds are opened and the leather-hard pots are removed. 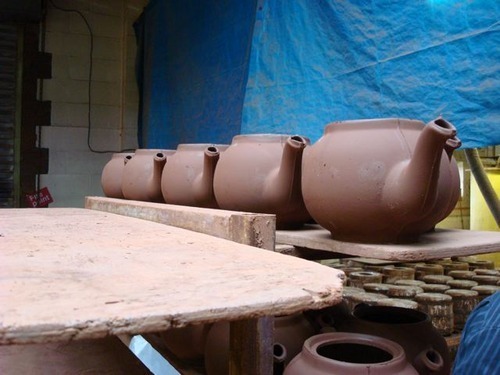 The raw pots will have moulded seam marks on them, so require trimming or 'fettling’ to ensure a smooth finish. Like all processes in the making of a Brown Betty, the fettling is performed by hand. 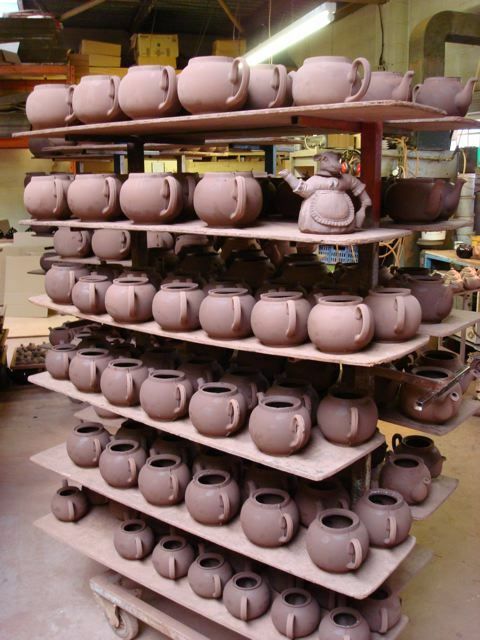 The finished pots waiting to be fired. 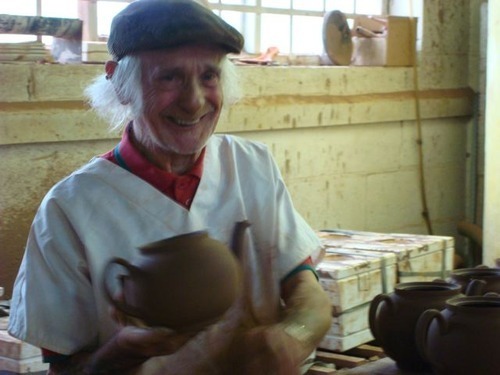 The red clay of the Brown Betty gives the pot its distinctive look ( and its distinctive name ). 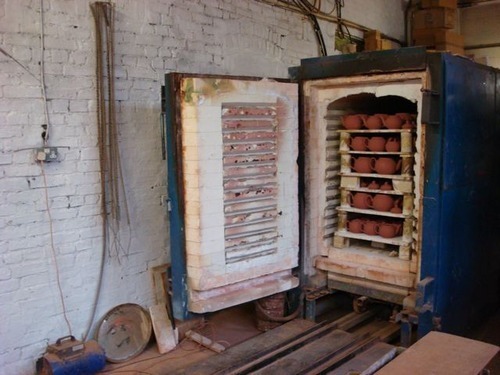 The kiln loaded and ready for firing. As the clay pot is dried and fired it shrinks in size, by a factor of up to one tenth. Here, a fired Betty is seen next to an unfired pot to illustrate the shrinkage. 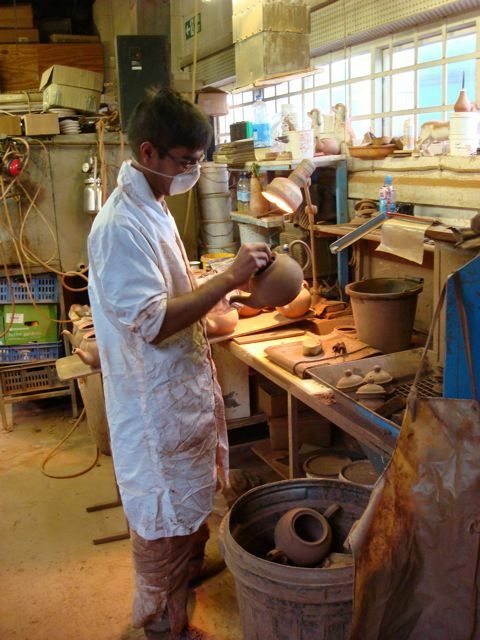 The final step in the process is the glazing, where a decorative and protective natural coating is fired onto the bare clay at high temperature. 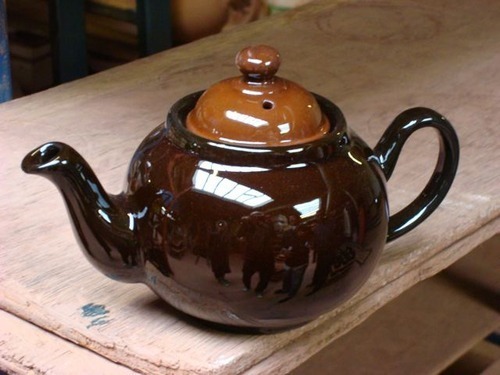 The traditional Brown Betty finish used a Rockingham Glaze to produce a deep, dark, rich brown colour. Teapot lids waiting for their dip in the glaze. 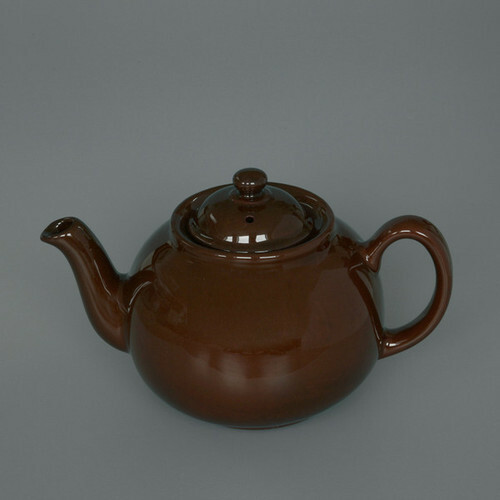 Many modern versions of the Brown Betty, however, use a somewhat flat and lifeless brown glaze so from this year we will be selling a clear glaze version of the Brown Betty. 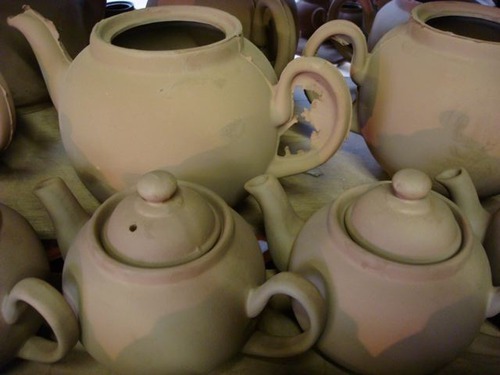 Not only does this show off the natural colour of the clay, returning the Brown Betty to the natural, lighter shade that is seen in many vintage examples, but it ensures that any teapot bought from Labour and Wait will stand out as a unique item. 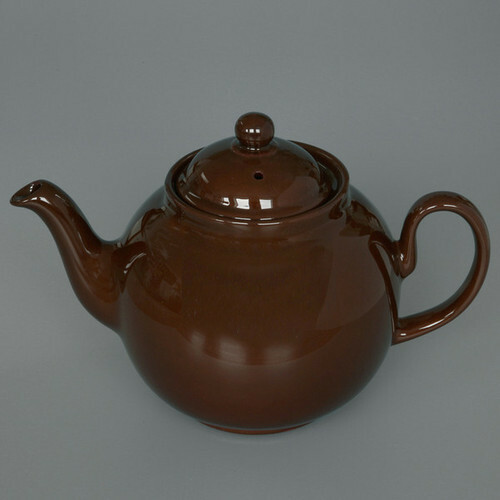 The clear glaze of the lid contrasts with the darker Rockingham of the teapot body. 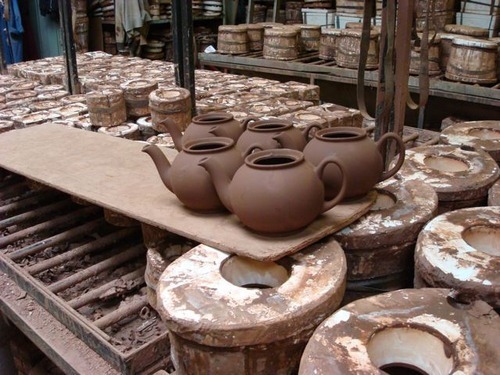 The functional and utilitarian nature of the Brown Betty has ensured its popularity from generation to generation, and so how pleasing it is to know that they are still being made by hand in Stoke-on-Trent to this day. The Brown Betty Teapot in a clear glaze is available in 2, 6 and 8 cup versions from the Labour and Wait shop or online.